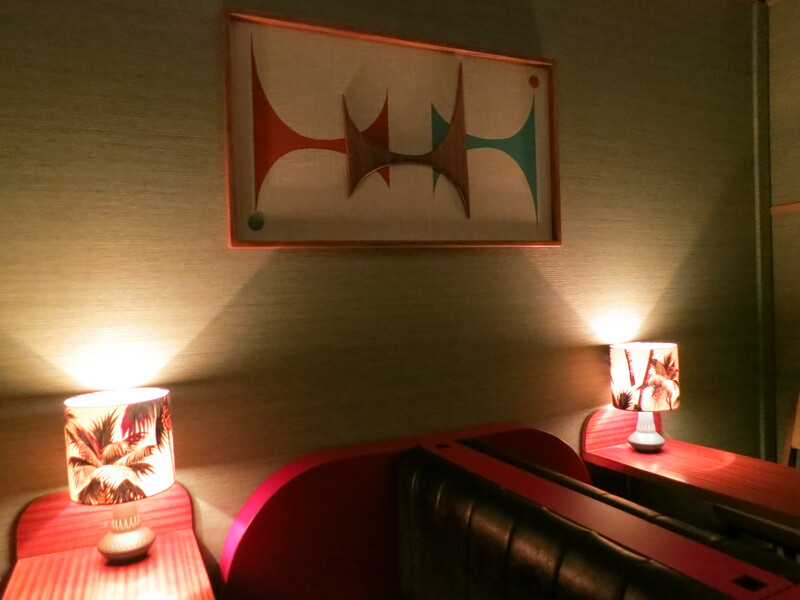 The boys behind the Tiki Lounge now have a new spot with a personality all its own. This time they’ve traded blowfish lamps and masks for something more midcentury modern. Here, you can sip like a Californian lounge lizard of the 50’s when “modern design” meant comfy booths, kicky palm prints and Jetsons-like abstract art. I grabbed a stool at the beautiful bright green tiled bar to check out the menu. The thirteen cocktails are an interesting mix. You’ll find a lemon drop, Royal Jamaican Yacht Club and Clover Club hanging with some of house creations that incorporate things like Duvel syrup or red pepper and coriander infused tequila. Also on the menu: a Dirty Martini. And, while I generally keep mine clean, this seems like an appropriate choice for a location rocking this kind American retro vibe. There’s a range of gins in the house including Hendrick’s, G’Vine, Beefeater 24, Beefeater, the Botanist and Monkey 47. At Lone Palm, things are more relaxed than you’ll find at some of the city’s very serious cocktail bars. Reuben was behind the bar and, if I understood (read: overheard) correctly, rather than coming from a bar background he has his own line of shoes. However, he still turned out a nicely made classic martini in a well-chilled glass that started my night off right. 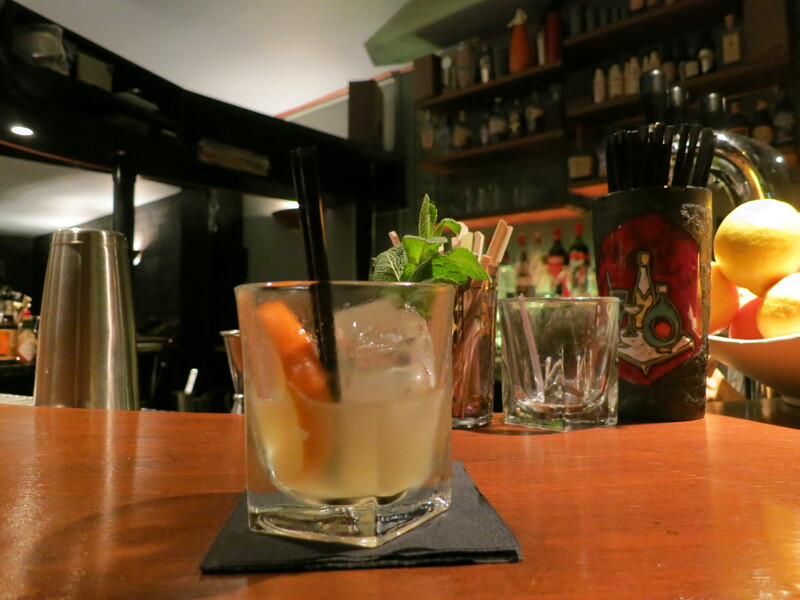 They’re ticking all the (now standard) boxes with bitters, freshly squeezed juices, a variety of spirits and so on. But they still manage to blend into the Bastille bar style with a low-key attitude along with low-key prices (7 to 10 Euros). And, with a happy hour from 6pm to 8pm and the Café Moderne just a few doors down, rue Keller is shaping up to be a fun option for a little bit of bar hopping. 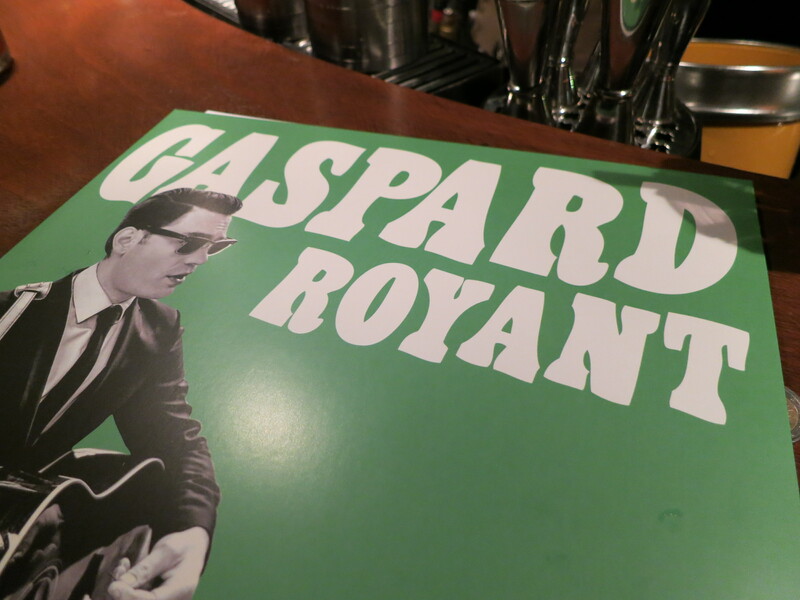 The night of my visit, French singer Gaspard Royant was in the house for a photo shoot. With his Roy Orbison style and vinyl tendencies, he fit in perfectly at this place with its rockin’ soundtrack courtesy of an old turntable behind the bar. Lone Palm is a laid back and nostalgic nod to simpler times that turns out good drinks at good prices without the need to put on airs.